Why to get a Chiropractic Adjustment? Which type of chiropractic adjustment is right for me? 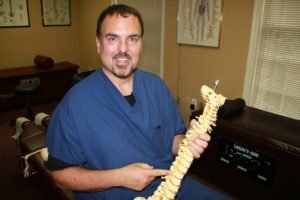 There are many types of Chiropractic techniques used by Dr. Conrad to relieve stress put upon the vertebral column and its extremities. Some adjustments made by the Dr. Conrad consist of a high velocity, short lever arm thrust applied to a vertebra, which is often accompanied by an audible release of gas (joint cavitation). Some techniques are very gentle, and each technique is catered to that patient’s specific prototol. Various types of chiropractic adjustments we use in our office include Palmer Package, Diversified technique, Thompson Drop technique, Activator Methods, Cox Flexion Distraction, and Gonstead technique. Our patient testimonials are a testament to Dr. Conrad’s attention to offering the best chiropractic care possible. There are times when joint cavitation or cracking does not occur and this is often due to either significant muscle splinting or the patient may not be adequately relaxed during the chiropractic procedure. At times like this, it is sometimes best for Dr.Conrad to apply ice, have the patient rest, or do electrical stimulation and massage prior to attempting spinal manipulation. Our office is proudly serving patients chiropractic care, physical therapy and massage therapy from all over the area, including Willow Grove, Horsham, Harleysville, Blue Bell, Lansdale, Montgomeryville, Philadelphia, and North Wales, PA., as well as Montgomery, Philadelphia and Buck’s Counties.